For the past five years Samsung has produces some of the innovative mobile phones in the market. They have come up with high tech Smartphones that are now a benchmark for many mobile manufacturers. Providing a wide range from low to high segment and catering needs of people all around the world they have given what people desire at a reasonable price. 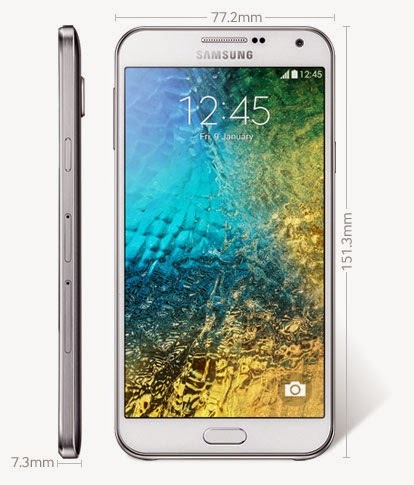 On January, 2015 they introduced a new member to its Smartphone family, Samsung galaxy E7. Here is the Samsung Galaxy E7 review in display, design, camera and software. 1. The phone has come up with LTE network making it a 4G Smartphone. Yes, It has its earlier network technology HSPA and GSM. 2. It comes with a 5.5 inches of Super AMOLED capacitive touchscreen with a resolution of 720 x 1280 pixels (~267 ppi pixel density) making it HD to enjoy movies and videos. 3. To satisfy the segment (Rs 1000 – Rs 18,000) of customers they came with galaxy E7 with Dual Nano-SIM functionality. This is very beneficial for those working class who carry more than one mobile phones with them. It eliminates juggling of phones. Calls are never missed using this feature of dual SIM. With the help of two SIM one can have an office number while in another a personal number. 4. It comes with latest Android Kit-Kat operating system with a Quad Core processor of 1.2GHz cortex A53 processor. This makes it strong to run multi applications at the same time and play games with full zeal and enthusiasm. 5. It has got an internal memory of 16 GB and an external upto 64GB. This combination of both internal and external memory you will find in many high tech Smartphone. 6. It has got powerful 2GB RAM which is sufficient to play games and switch over multi applications, enjoy its experience. 7. The phone has 13 MP rear camera, 4128 x 3096 pixels with autofocus and LED flash that provides high quality natural images. Samsung focuses on the camera quality in manufacturing the Smartphone. It has 5MP front camera to take selfies. 8. It provides faster connectivity using Wi-Fi 802.11 b/g/n through which you can share and have quick downloads. 10. The phone has a mammoth lifelong Non-removable Li-Ion 2950 mAh battery that helps you to enjoy for long hours. The phone is comfortable to hold and easier to handle. The device runs Android 4.4 Kit Kat but updates to 5.0 Lollipop are expected sooner. Performance felt snappy and the screens were reasonably sharp and rich under indoor lighting. You will not experience any sluggishness in the Galaxy E7. The Samsung Galaxy E7 appear to be solid mid-range offerings which will compete with similarly priced devices from the likes of HTC, Sony, Microsoft, LG, Oppo, Gionee and others. Overall till now Samsung Galaxy E7 review has been exceptionally great in terms of camera, processor, memory and battery.